Home / Blog / Garvey Park Ascot: The perfect location for Stand up Paddle Boarding! Garvey Park Ascot: The perfect location for Stand up Paddle Boarding! Garvey Park in Ascot, WA is a hidden treasure on the banks of the Swan River and home to the Ascot Kayak club, the largest Kayak club in Australia! The combination of Stand Up Paddle Boarding and Kayaking is a perfect synergy as the two passions for the love of being on the water come together and SUP Tonic Australia is privileged to be sharing this sensational location. The park offers everything from the well-equipped childrens’ playground, plenty of parking, abundant birdlife for the avid bird watcher, BBQ’s, cycle paths and is on route along the fun Swan River Ramble where families can search for “Eric” and unlock information with their QR reader about that stop! Garvey Park also offers views of the tiny Ron Courtney Island that sits in between Ascot and Ashfield Flats and was once attached to Garvey Park up until 1969. 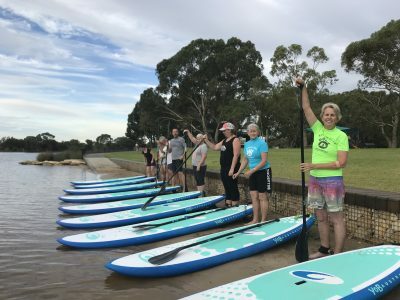 The island provides a fun course to paddle around on a SUP or Kayak and is a point of interest for folk who take a lunch cruise to the Upper Swan Valley on the graceful Captain Cook’s “River Lady”. There is a lot to do here at the beautiful Garvey Park and if you’re looking for something a little bit different consider hiring a stand up paddle board or book your SUP party and we will make your time on the water is one to remember! We can cater to almost any requirement including parties for all occasions, group lessons or corporate bookings. If you haven’t yet discovered this hidden treasure pop on down or make a plan to visit soon and be pleasantly surprised at what you will find at the end of Fauntleroy Avenue, Ascot!